It's an electric jolt of spooky on Day 10 with Krangenstein Lives! from Season 6! 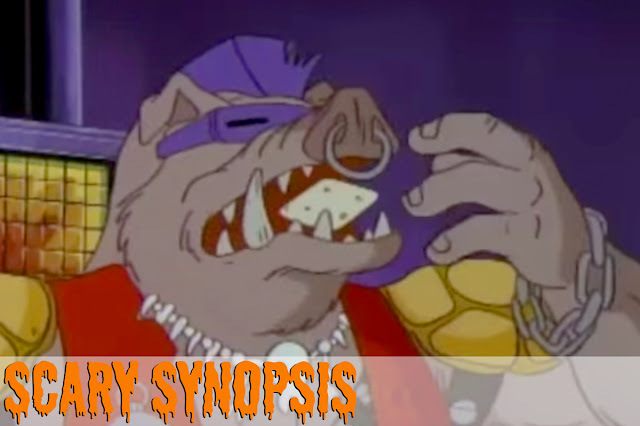 Bebop accidentally eats one of Krang's computer chips that he confuses for a cracker. In a desperate attempt to cover his tracks, the idiotic mutant substitutes the real micro chip with one from his video game. Krang inserts the false circuit into his new Android Body, which then goes out of control and terrorizes New York City! Yes. The plot really is that absurd. Krangenstein Lives! is like a Frankenstein sequel. No new ground is being broken - both the plot and monster are familiar to the audience. It's a rehash, only slightly expanding on the existing universe. But also like a Frankenstein sequel, that doesn't stop us from enjoying it. Sometimes it can even be better than the original (I'm looking at you Bride of Frankenstein). Krangenstein Lives! doesn't reach those levels and isn't better than its original (Shredder & Splintered, Season 1), but man, it's darn entertaining. The menacing monster of the episode is Krang's Android Body. Like any good sequel, the suit has been given new attributes to keep the story fresh. Its recent upgrade allows it to expand or shrink its size at any given moment. The new move conjures up a few hair-raising scenarios that remind us of classic horror films. 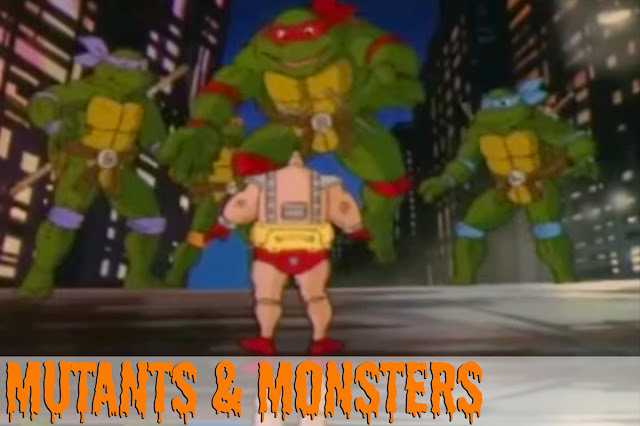 When the Android Body is massive, towering over the Turtles, it's a nod to giant monster movies. Scenes where the Android Body is very tiny, embrace cinema with miniature killers, such as Child's Play, Dolls, and Trick 'R Treat. If you're a horror fan, it's a buffet of horror movie homage. The creation of the Android Body is one freaky scene. With stark shadows and minimal lighting inside Krang's mad scientist-like laboratory, it's an obvious pluck from a Frankenstein movie. Sealing the deal is Krang screaming, "It's alive, it's alive!" Spoiler-alert! The Android Body gets destroyed at the end of the episode. The visual is unnecessarily cruel - a grim pile of body parts lumped together. It reminds me of a defeated horror movie killer at the end of a film - specifically Chucky's deformed and collapsed carcass in the conclusion of Child's Play 2 (a movie that was actually released 3 years after this episode). The visual is also very foreboding. 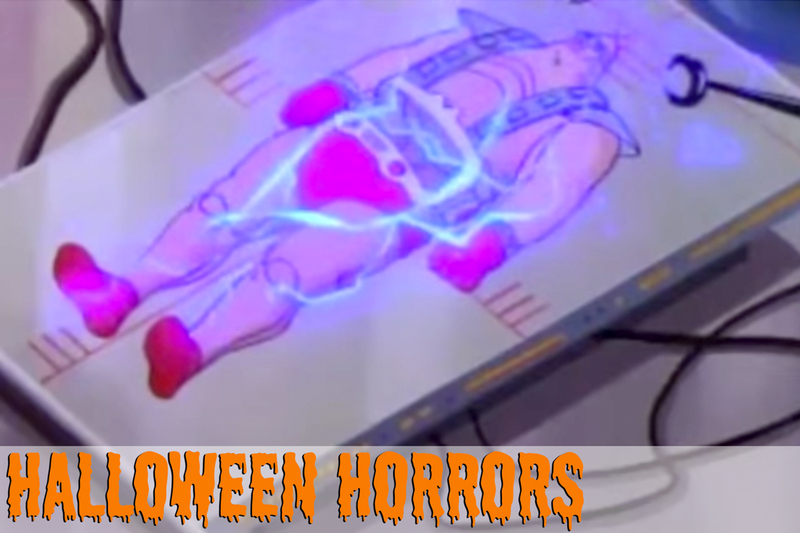 Will Krang's Android Body return to give us one more scare? This shot. The composition. No one needs to see this. 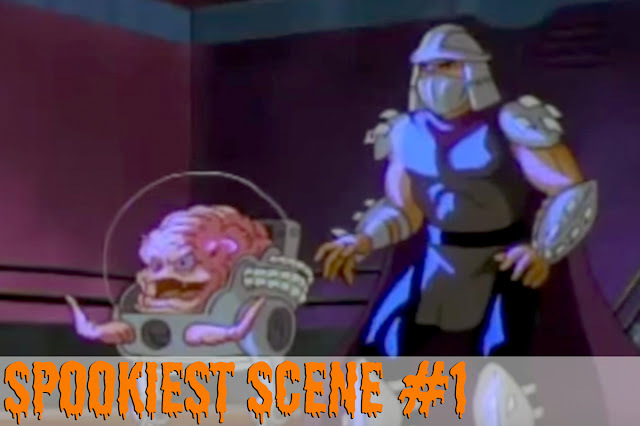 Krang, that move ain't classy. 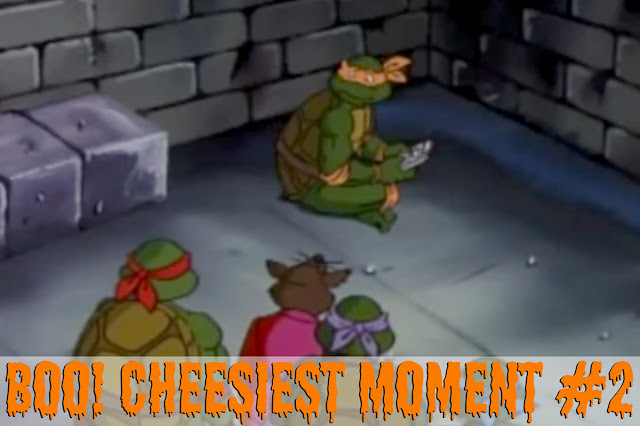 Throughout the episode, Michelangelo has an overly-annoying addition to video games. The party dude brings no party to the episode. He lifelessly sits around, hunched over being an anti-social video game-obsessed loser. The other characters in the episode find it annoying, and you will too. Krangenstein Lives! is a dark episode that doesn't break new ground, but keeps the fun fresh and the scares nonstop. The Android's Body ability to expand and shrink is a visual amusement that screams horror movie-style. 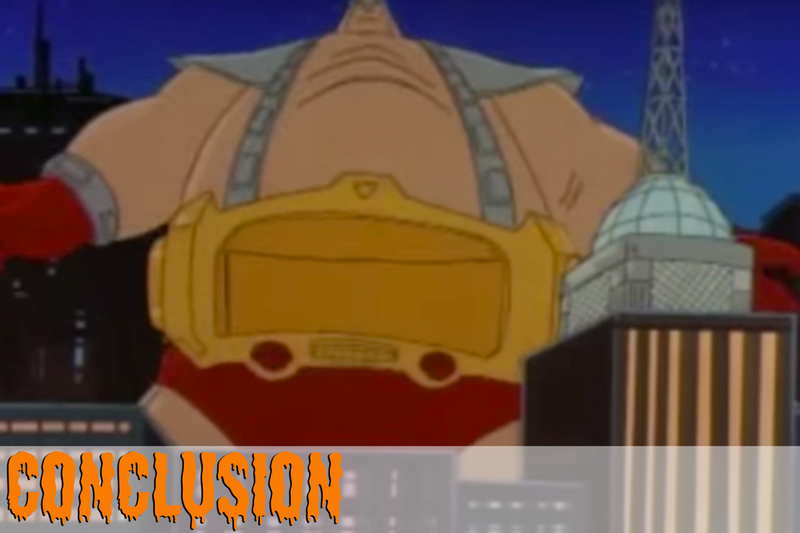 If you're a fan of Krang's suit and Halloween, this the ultimate episode. It doesn't get any better. Check back tomorrow for Day 11 of Horrors In A Halfshell! 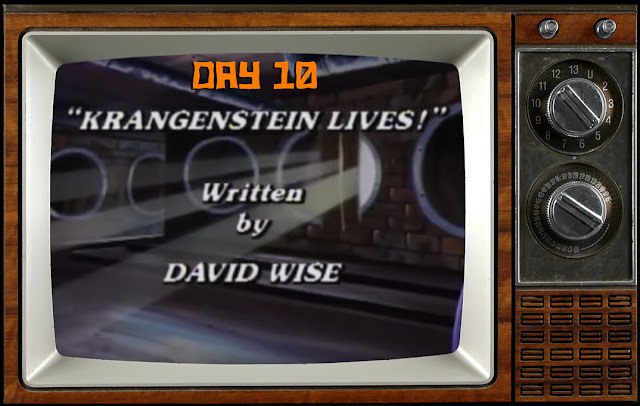 DAY 5: INVASION OF THE KRANGAZOIDS! Shredders are valuable from numerous points of view. These days loads of individuals are getting to be casualty of data fraud. Appropriate transfer of archives with the assistance of miniaturized scale cut shredder can keep you from personality string. amazing !!! good work. keep it up. find good paper shredder from here. Its really worth to read this post thanks for Sharing amazing post. What a great platform that for such nice information. its nice to be here thanks for information.